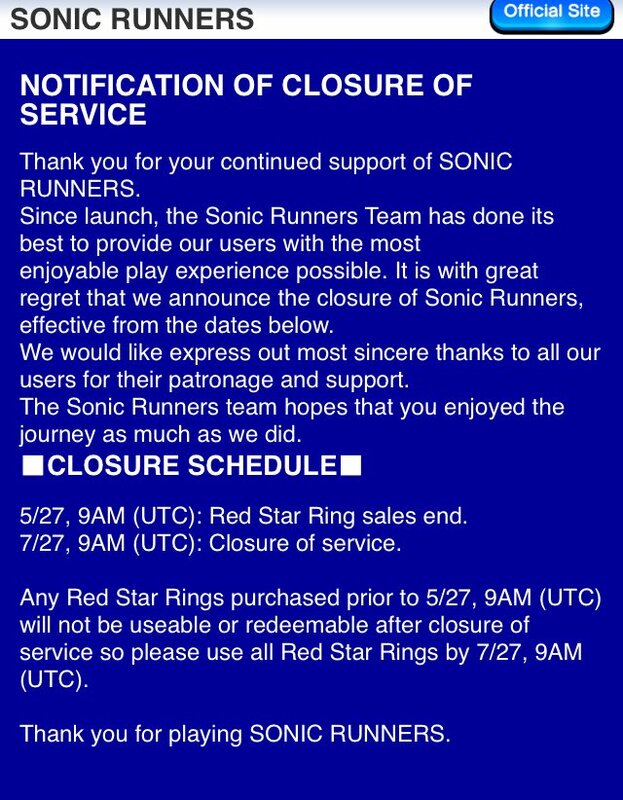 Sonic Team’s attempt to bring a Japanese developed Sonic game to mobiles is sadly closing down. Looks like its poor performance in sales might be the cause for this decision, as Sega Networks reports placed Sonic Runners on a bad light, despite the efforts to push it made with the recent changes ingame made with update 2.0 and the big push they had with this game during 2015, making it almost the “Sonic game of the year”. But seems like they are not enough, as they announced today that the game is closing down next 27th of July, being a little over a year since its woldwide release in June 2015. From today, users won’t be able to buy Red Star Rings, but they can play the game and use the remaining rings they might have until next 27th of July, the servers close down date. You won’t be able to access the game once the servers are closed. Sonic Runners brought back forgotten characters like Tikal, the Werehog, Mephiles or Classic Sonic, along with fan favourites like Shadow, Metal Sonic, the Chaotix, and even Sticks from Sonic Boom. Collaborations with other Sega franchises like Nights into Dreams, PSO or Fantasy Zone were also one of the highlights of this 2D endless runner game. New Information: Sonic on GameCube?